The Marsupial lion, Thylacoleo, is an extinct carnivorous marsupial which lived in Australia from 1,600,000 to 46,000 years ago. It was the largest marsupial carnivore to have lived in Australia. Fossil remains on the dry Nullarbor Plain show that humans and climate change probably caused the extinction of the Australian megafauna about 45,000 years ago. The animal was robust with powerfully built jaws and very strong forelimbs. It had retractable claws, unique among marsupials. This allowed the claws to remain sharp by protecting them from wear when walking. The claws were well-suited to holding prey and for climbing trees. The first digits ("thumbs") on each hand were semi-opposable and bore an enlarged claw. Palaeontologists believe that this would have been used to grapple with its prey, and gave a sure footing on tree trunks and branches. The hind feet had four functional toes, the first digit being much reduced in size but possessing a roughened pad similar to that of possums. It may have assisted with climbing. It is unclear whether the marsupial lion had syndactyly (fused second and third toes) like other diprotodonts. It had strong claws and very powerful jaws. Biologists estimate that it had the most powerful bite of any mammal, alive or extinct. It was able to hunt animals like the giant kangaroo and the giant wombat, but its big jaw would have made it hard for it to hunt and kill small animals. The marsupial lion could weigh up to 130 kg (287 lb). It was about 1.5 m (5 ft) long, and stood about 75 cm (2 ft) tall. Fossil bones of the marsupial lion have been found in caves on the Nullabor Plain. Scientists have estimated their age at between 400,000 and 800,000 years old. Cave paintings of marsupial lions in northwest Australia, discovered in 2006, depict them with a striped back, tufted tail and pointed ears. In 2009, after a long drought in southeast Victoria had dried out many lakes, a farmer near Ballarat discovered fossil footprints and a jawbone of a marsupial lion preserved in limestone in a dry lake bed. 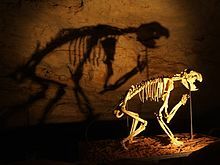 ↑ 1.0 1.1 1.2 "Australia's Lost Kingdoms - Pleistocene marsupial lion". www.lostkingdoms.com. Retrieved 2009-05-17. ↑ "News in science - marsupial lion reignites megafauna debate - 25/01/2007". www.abc.net.au. Retrieved 2009-05-17. ↑ 4.0 4.1 4.2 "Ice Age marsupial lion a real nipper of a beast - National - www.theage.com.au". theage.com.au. Retrieved 2009-05-17. ↑ "Marsupial lion was fast killer". www.theaustralian.news.com.au. Retrieved 2009-05-17. ↑ "Underground monsters found - Science - Specials - smh.com.au". smh.com.au. Retrieved 2009-05-17. ↑ "Cave painting depicts extinct marsupial lion". news.yahoo.com. Archived from the original on 2009-05-20. Retrieved 2009-05-17. ↑ "Mega-marsupial grave in dry lake". www.news.com.au. Retrieved 2009-05-24. This page was last changed on 7 December 2017, at 11:34.